There are two valleys on the West side of the Kings Valley. 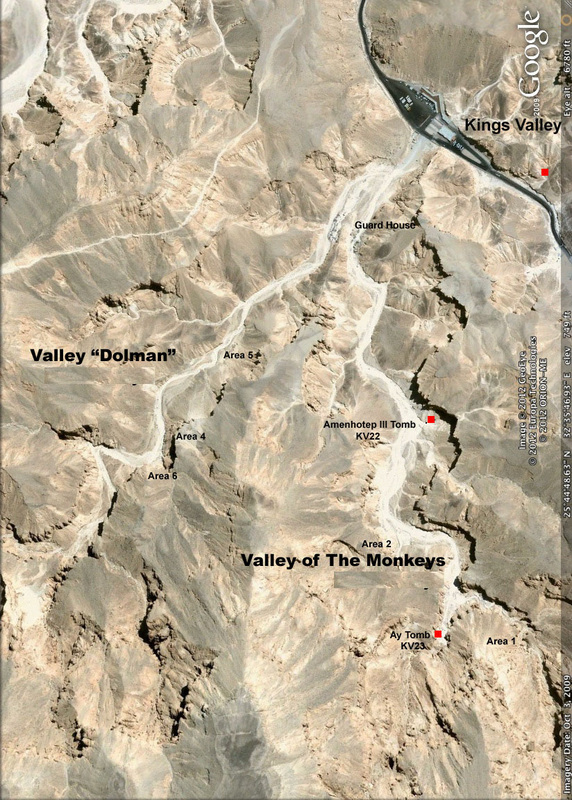 Valley of The Monkeys and Khuouy. 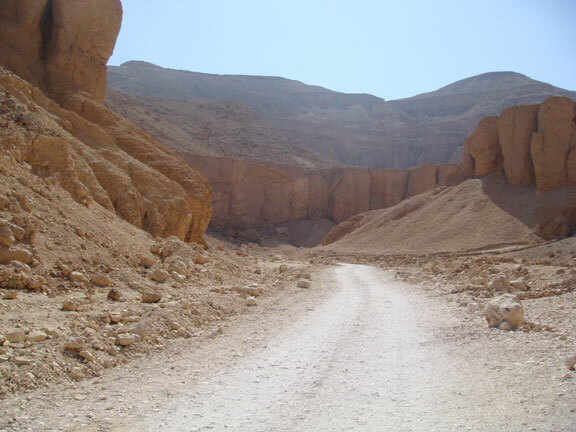 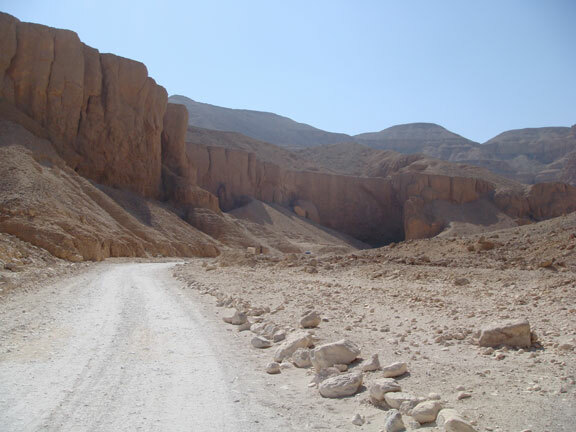 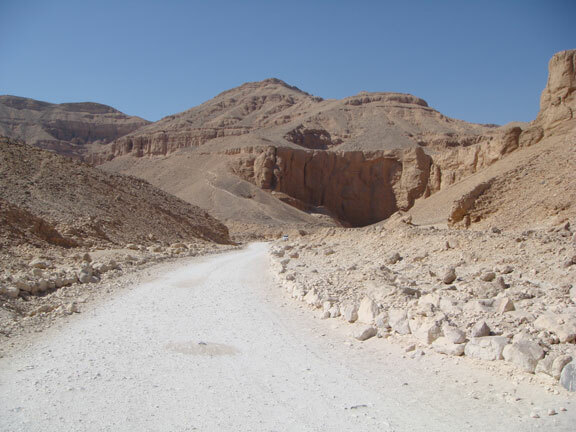 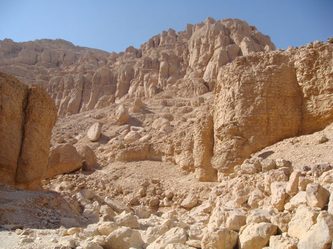 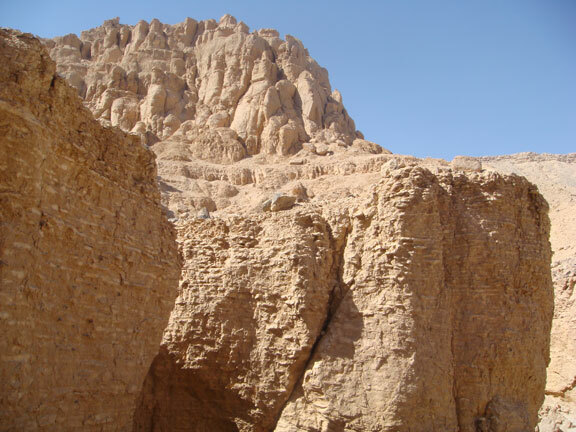 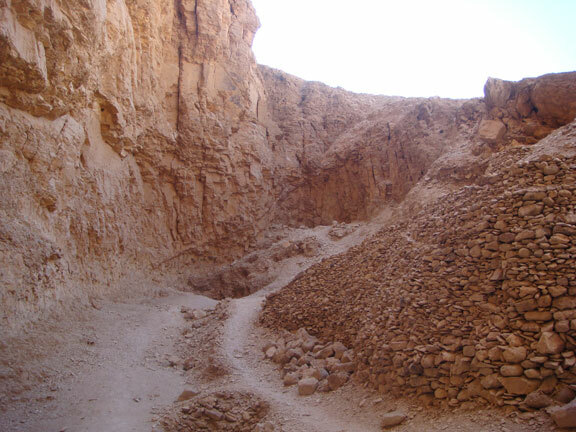 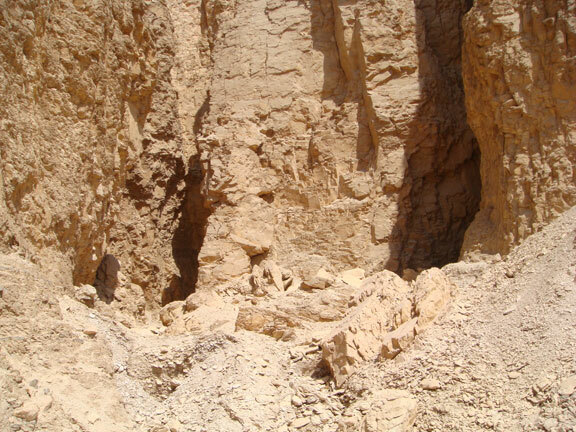 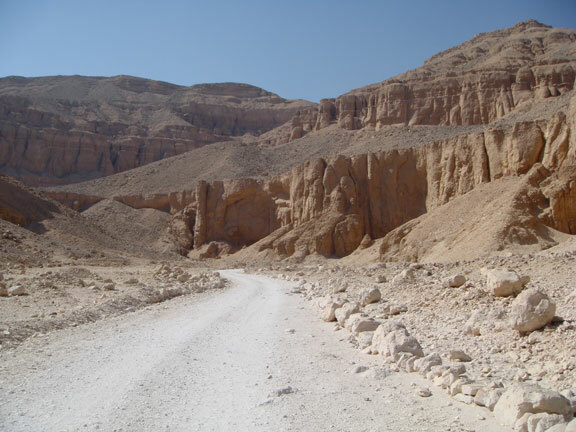 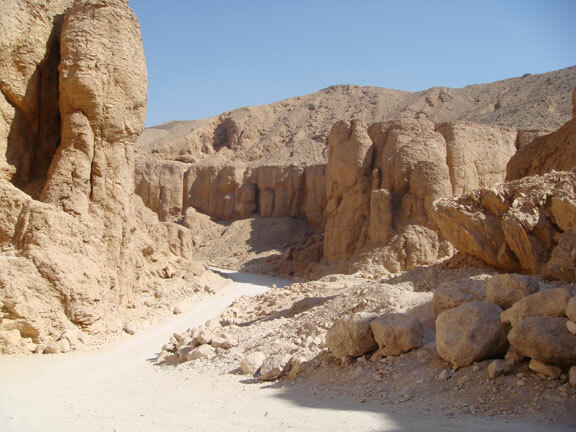 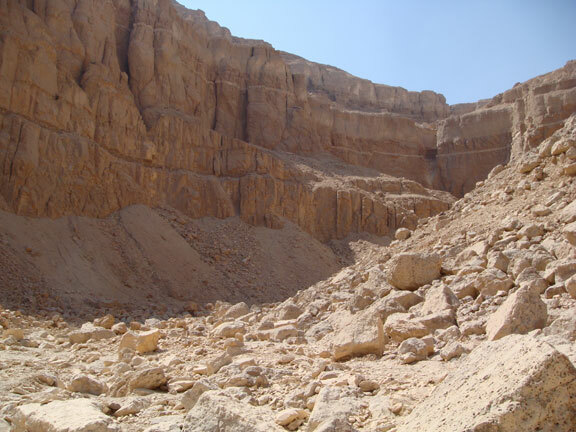 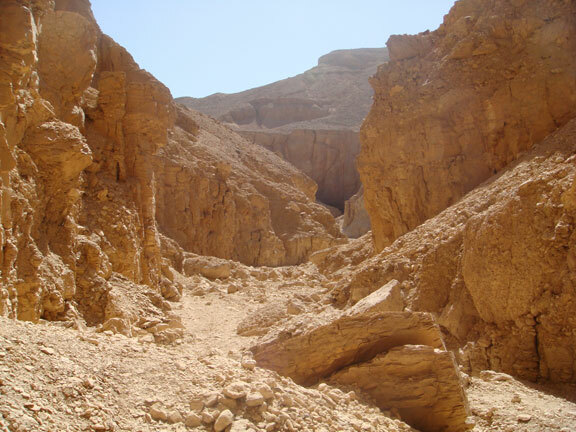 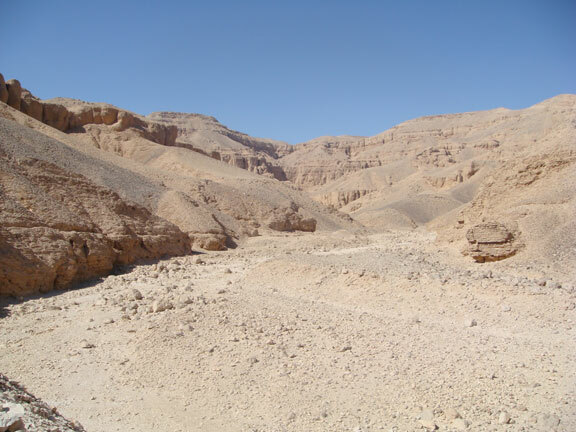 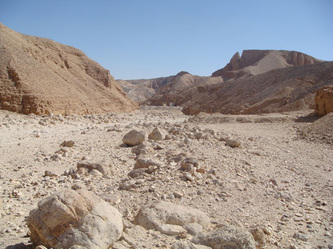 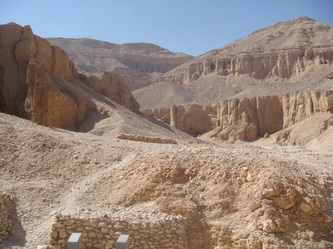 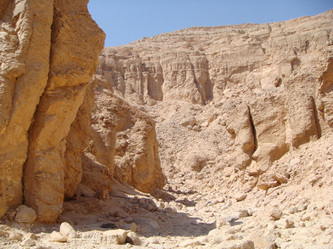 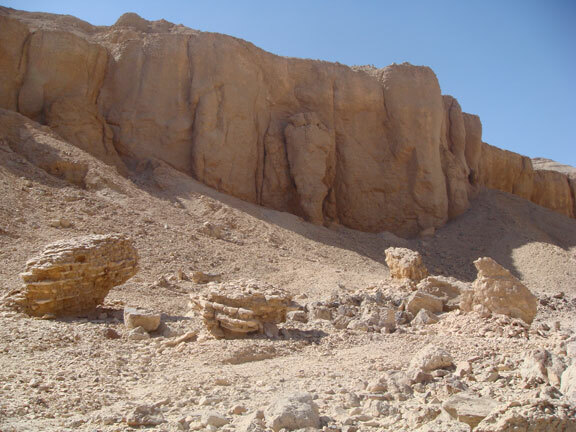 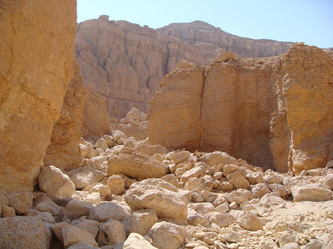 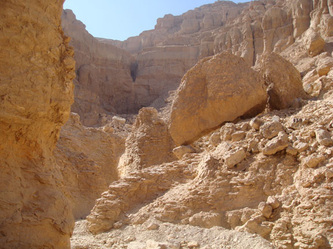 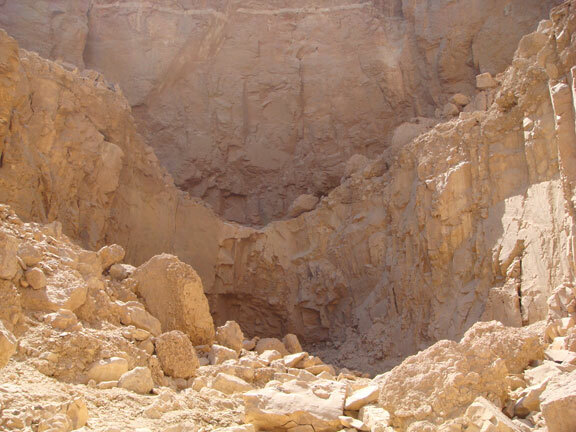 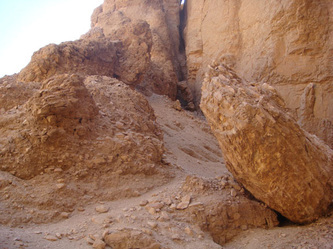 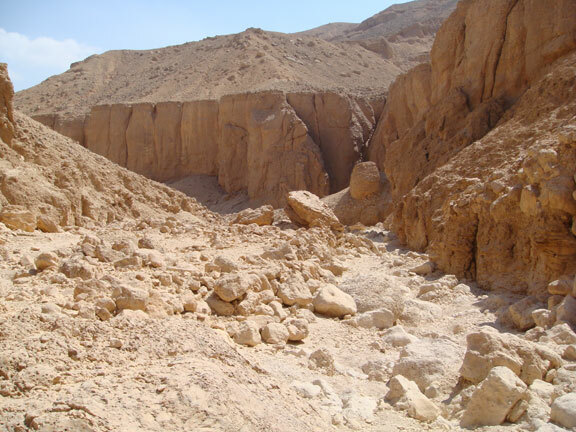 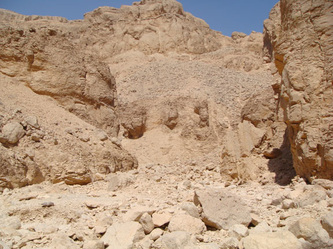 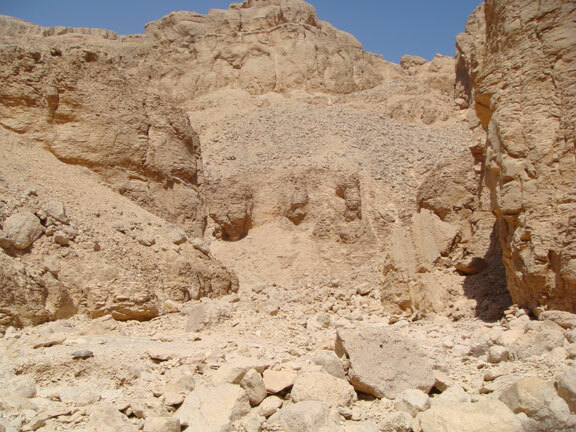 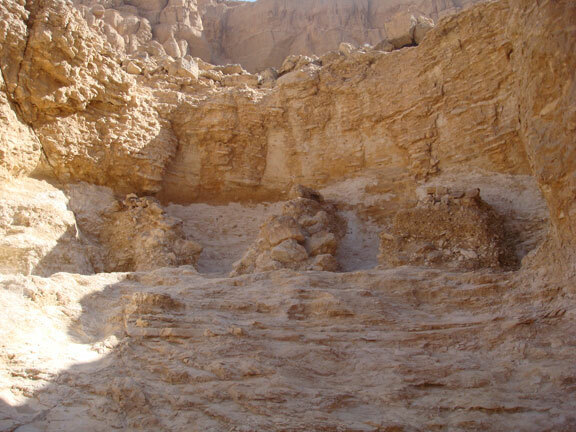 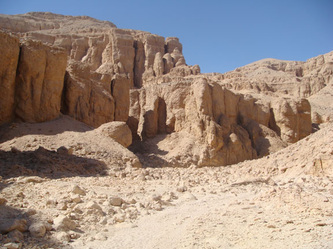 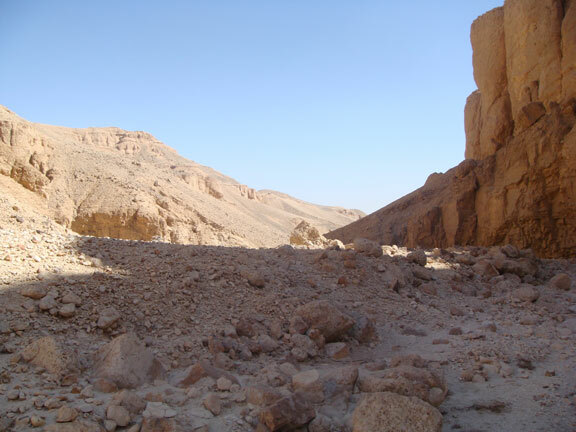 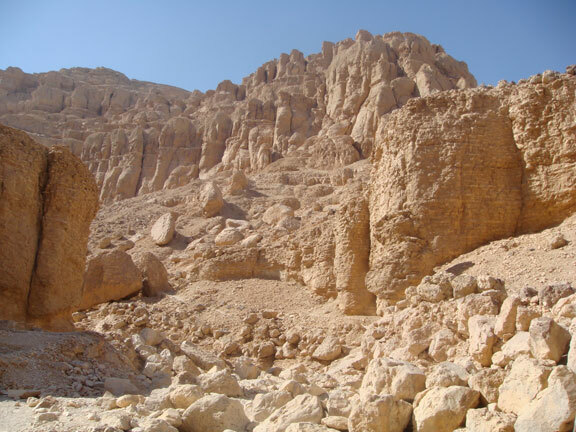 Wadi al Gurad (Valley of the Monkeys) has two tombs, that of Ay - KV23 and Amenhotep III - KV22. The valley does have tourists but few. According to Ali a guard there, they alternate between the two tombs and only one at a time is open. Amenhotep III is at present closed for restoration. 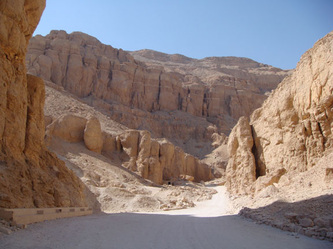 Khuouy (Dolman) Valley is amazing. 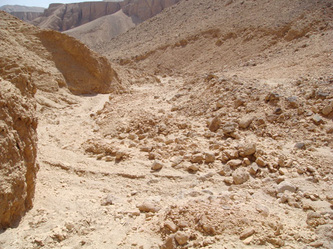 Although the track on the map makes it look passable it is indeed impossible by any vehicle and only by walking is it accessible. This picture was taken from the entrance ticket. 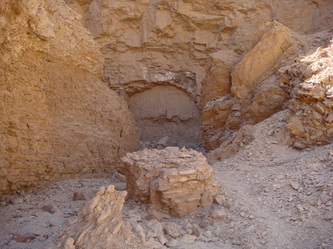 Ay Tomb KV23. 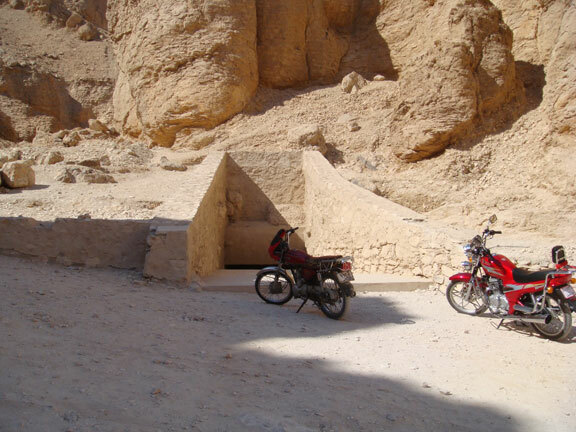 Not an impressive tomb. 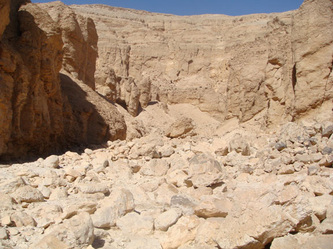 It has a larger than normal corridor that leads a long way down deep into and under the mountain. This corridor is undecorated. 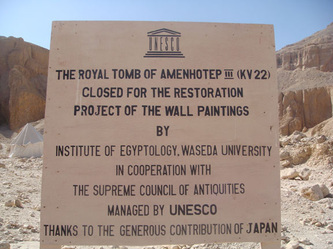 It ends at the Sarcophagus room. The sarcophagus made from grey granite is beautiful, the drawings on the walls are not in good condition and only one wall was looking quite fare. 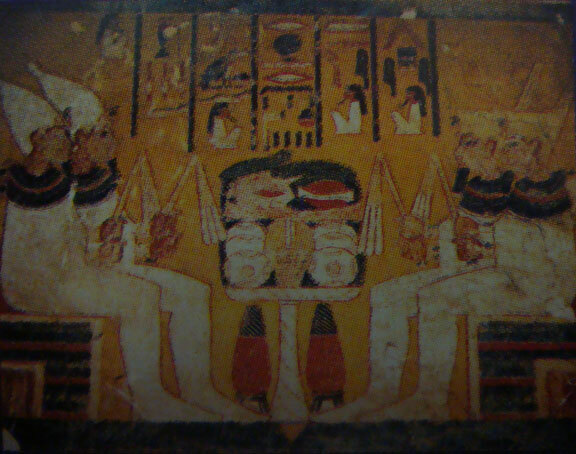 From this sarcophagus room there was an anti chamber which I believe would have been use for provisions for the after life journey; that also was undecorated. 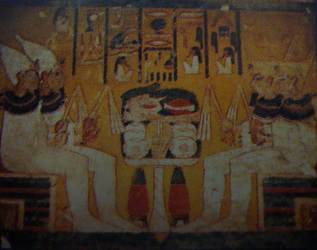 Picture top left is near to Amenhotep III Tomb KV22. Ali a guard there tells me that there are several places where excavators have been at work but up to now, only two tombs have been found. 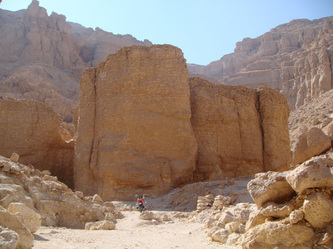 This truly is an amazing and wonderful place. 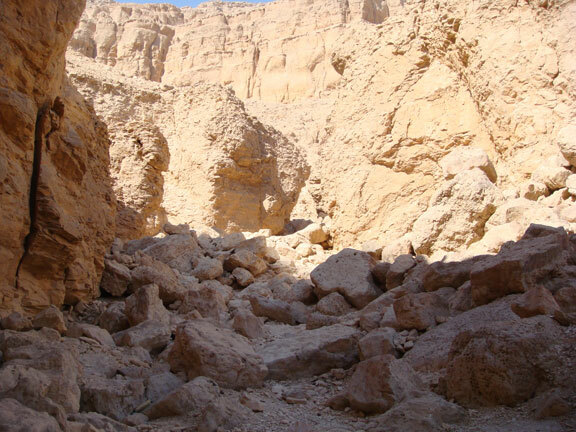 There is no sign what so ever of man having been here and upsetting the natural balance of nature. I had this valley completely to myself. No tourists, no hikers, just me and many kilometres to walk. 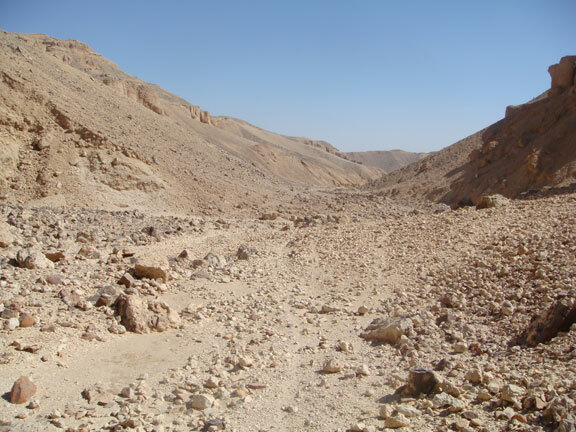 This valley is easily three to four times longer than the Kings. 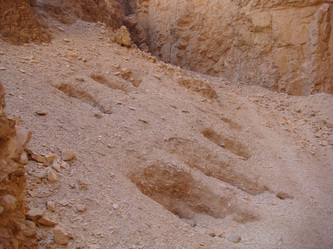 At the entrance you can see the evidence of tipping. 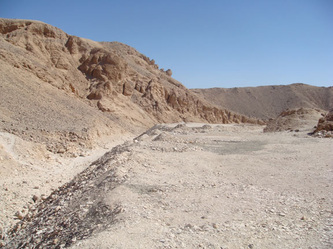 I would assume that over many years of digging in the Kings Valley, they took all the soil and so on to this place to dump. It is very evident here that there must have been at some time torrents of water cascading down and through this valley. You can see the rocks and boulders that have been pushed along and through, you can see the sand like silt and natural walls that have been made by the strong water cutting and flowing around bends. 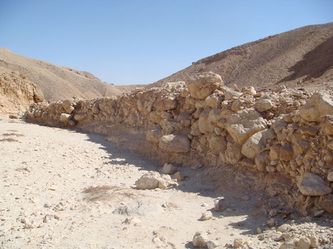 That might look like part of a mud brick wall on the right, but no, it is natural worn rock. 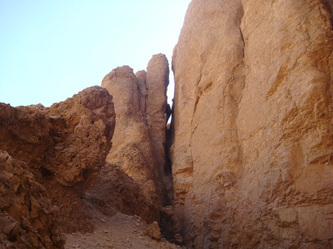 The last part to the end entailed some hardy rock climbing. 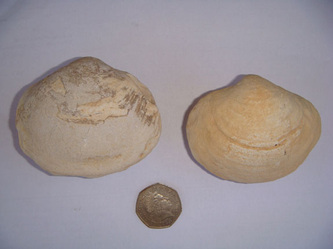 These fossils are likely to be Pleuromya or Bivalves (Oysters) from the Jurassic period 200 - 146 mya. 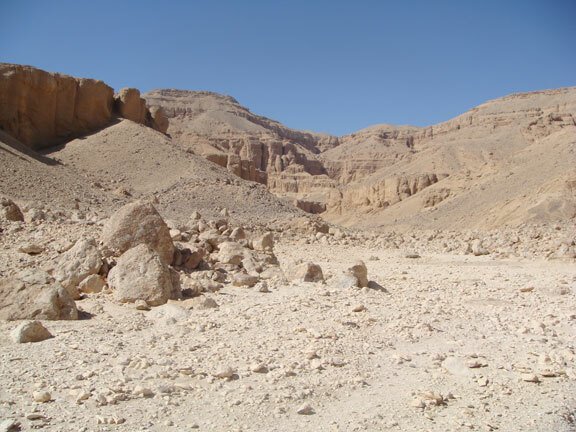 This valley is a step back in time and no one and nothing except for nature has changed its landscape for many a thousand or more years. It is beautiful with stunning shapes, structures and colours. I would imagine that at different times of the day the sun would play with this stunning landscape. 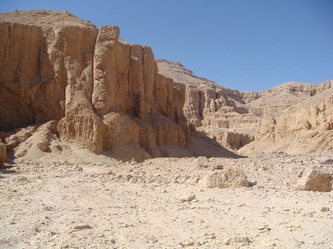 It could quite easily become one of my favorite places to visit, to get away from humanity as such. 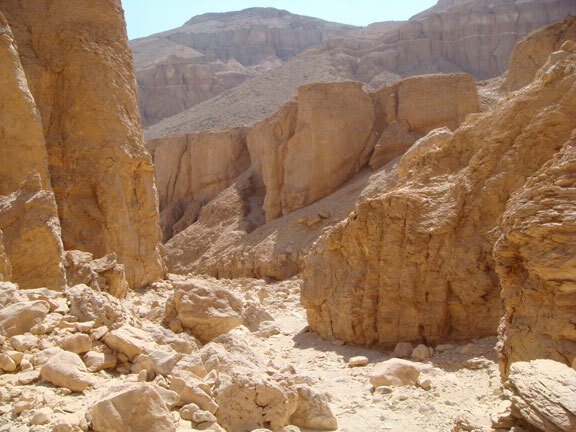 To find peace and tranquility and even to imagine a dinosaur coming around the corner. The only sounds here are of birds and in places, the echo of my walking. 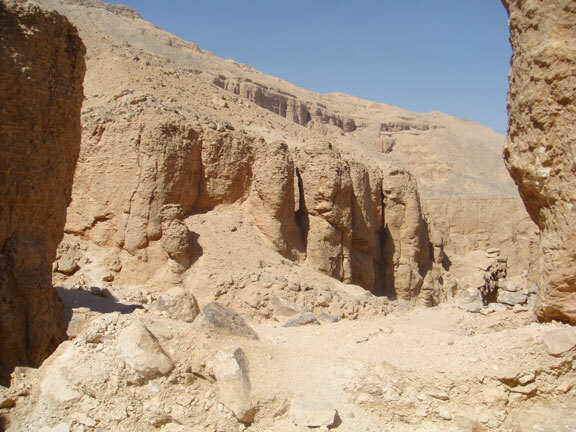 What an adventure this week.